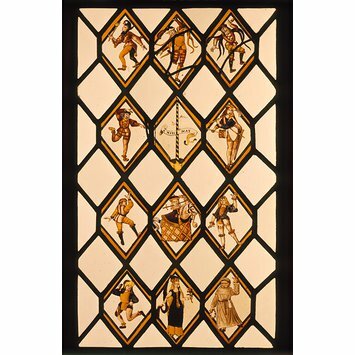 These quarries (small diamond-shaped panels) of stained glass were first recorded at Betley Hall in Staffordshire, home of the Tollet family, in the 18th century. The glass may have been made before the mansion was built in the early 17th century. They were salvaged when the building was demolished in 1783, and leaded into a window in a new house built on the site. An increasing proportion of glass made towards the end of Elizabeth I's reign (1588-1603) was destined for domestic interiors. Glass painters often referred to prints for inspiration. Some of the figures in these quarries are thought to be based on an engraving by the prolific German printmaker Israhel van Meckenem (born around 1440-1445, died 1503). The Morris dance was an element of festivities at court and at popular communal celebrations in Tudor England. Its participants were commonly depicted in art of the period. Arranged around a maypole (a tall decorated pole) are a fool, six dancers wearing bells, a man on a hobby horse and another playing a 'pipe and tabor' - a type of flute played with a small drum. The female figure in the centre pane on the bottom of the window is likely to represent the Queen of May. These quarries date from a period when coloured window glass became increasingly scarce. As a result, a method was devised for painting white glass with coloured enamels. This enabled glass painters to produce far more detailed compositions than before. Most colours were made from ground up glass and fixed by firing in a kiln, but the blue used here was not produced until 1550 at the earliest. Layers of silver-based stain were also used to achieve various tones of yellow. Twelve truncated quarry panels arranged with clear glass in a window in the format of three across and four down. Each depicts a figure except for that in the second row down in the middle which depicts a maypole with the inscription 'A Mery May'. The twelve decorated panels depict the following : A fool. Six panels each show a man dancing. A maypole. A man playing a pipe and a tambour. A man on a hobby horse. A woman with a long veil holding a flower - probably a representation of the Queen of the May. The window was probably made in around 1621 for Betley Hall, Staffordshire. This building was completed about this time. The window remained in that house when it was rebuilt in 1783 and was only removed in 1922 when it was sold at auction and subsequently installed at Leigh Manor, mear Minsterley, Shropshire. Nicol, E.J. 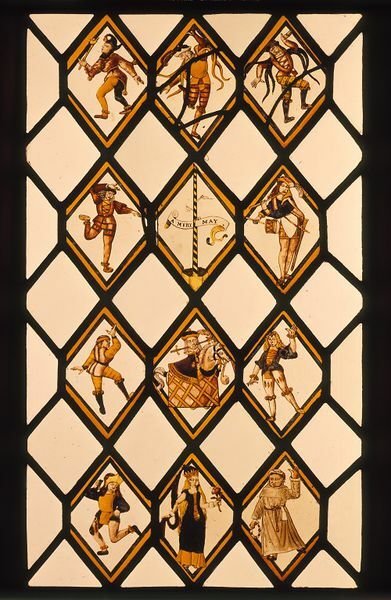 'Some notes on the history of the Betley Window'. English Folk Dance and Song Society Journal. Reprint no.7. London, 1953.